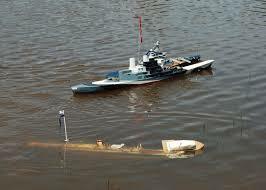 Radiocontrolled model submarine during pool trials. Anyone know where I can find that clip of the Titanic reversing her engines? An expensive day for the Hong Kong tug boys! not to burst your bubble on that one Bryan, but in those days the steering, so I have been told, was based on the old aspect of "Tiller steering" whereby to steer to starboard either by tiller or by rope steering on the old sailing ships the wheel or tiller had to be pulled or steered to port, and vice versa. As such the early steam ships, still a throwback from the old days of sail where still set up that way, and as such by turning the wheel to port she would have turned to starboard..........try steering a narrow boat...a similar concept. I know it's not maritime related but you've got to go some to equal this. Indeed. I think the logic is that the ordsers were in the form "Starboard your helm" or "Port your helm" so tiller to port caused boat to turn to starboard. he same would have been true ofthe eralier whipstaff steering of bigger ships and was carried over into wheel steered ships to avoid confusion. I'm sure there must be a reference somewhere as to when the Navy in particular took a decision to change to the present convention. Agreed that is a good clip along with Martins , not sure how the wife would take to me bringing that back home.. However I think that for me it was the Fly past of the Jet Model of the Vulcan at this years Woodvale which is about 33 seconds in to the video and the flying display of 3 Lancaster's also at the same show which did it for me. Most impressive model I've seen flying in the last couple of years is Ali Mashinchy turbo prop Spitfire... but I can't find the video. A question about watching some of these videos. Frequently I find that the vid. starts to load, it plays for a few seconds but then freezes (apparently to load the next few seconds of action). This continues throughout the length of the video but does not happen once it is loaded and I start "Replay". Is there any adjustment I can make to my settings to avoid this? Good question Roger.... I dunno! I am on 20mb and it still happens to me now and again. Its just one of those things..
Roger your connection simply isn't fast enough to be able to stream the video so as has been said pause the video until it has all loaded then press the play button and you will be able to view it smoothly all the way through. You need a pretty good broadband connection to be able to see them first time round as video is still pretty demanding on your connection even at You Tube resolutions!! Anyone know how to improve the quality of a video when Uploading?